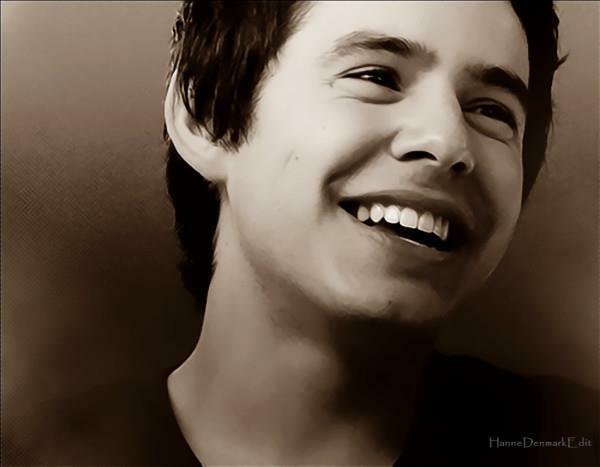 Why do you still keep on listening to David Archuleta? Seriously, why? Is he that good? — Yes, he is that good. — Why let go? He is that good. I think you are insane and ridiculous. — Ask me a smart question then. — Cos it wanted to get to the other side. — Thank you. Smart question. A smart woman like you listening to him day in and day out and waiting for him like forever? I just don’t understand it. — Just like you don’t understand why the chicken crossed the road. I mean, just look at your collection …David Archuleta…David Archuleta…David Archuleta … Not bored meh? — How can you ignore and get bored with a voice that tugs and pulls at your heart? I think you are just blown away by his cute baby face. And you want to ruffle his hair. But he is so tiny. — Says who?! What’s that got to do with it?! He is near perfect! He is wonderful! Best things come in small packages. Small body – Big Heart! Aiya, who cares about heart! You can’t see it. — But I can feel it. And I can hear it. Nah, he needs to have a make-over. — And you, my friend, needs a think-over. He can be your son, y’know. — Or my great-grandson…what’s the problem? He abandoned you, didn’t he? — It’s not like that. And he broke your heart. — He’ll be back. I’m sure of that. Why did he leave you? — Because there is Someone much Greater and much Higher than I. When he comes back, he’ll have no fans left, y’know. — If you had not reached out to him and let him touch your heart, you wouldn’t grasp his true beauty or understand delicate matters of the heart. A person of strength and tenacity is able to muster a great deal of patience and endurance for a very long time to wait for something or someone who is worth waiting for. Wah, long speech. So intense! Must be serious. — It’s your loss. You have my sympathies. If I, I chabut already. Come, let me take you shopping to go buy some new and really cool cd’s on happy rappin’ and groovin’. They’ll cure you of these Oppressive Dumb Doldrums! — Ai hello, there is no cure ok? And if there is, I don’t want it. Leave me alone. Go away. I’m Happpyyyyyy……Duh!! Yes we are happy. Happy for what David had given us. Happy to wait. And Happy in anticipation. Have you guys had to defend yourselves too and go through some Dumb debates? ← Happy New Year from David!!! Hey, I just saw that David’s BEGIN. is in the Top 3 in a Latin American Music Chart! Woohoo!! I wonder which country it is. I think all of us have been asked to justify our love for David at some point of time. But it’s always difficult to convince people how wonderful his voice is, they just say he’s cute. Which he undoubtedly IS but that’s not why we liked him in the first place. I think some people have this inability to appreciate the beauty of his voice. In that sense, we are the priveleged ones. The fact that our devotion to him can be quite unexplainable, even to ourselves, makes him more worthy of it. I don’t think you’d call these debates dumb though. Or perhaps it’s our own fault? For jumping, at the drop of a hat, to defend him? You have a valid point there, that D was very young when he “graduated” from AI and when he came to our attention. For example: his goofiness and “confession” that “he had never been kissed” (at that time anyway) shocked everyone, because he did not follow what most people would term as “the norm” for a pop musician, and saw him as “this weird kid” – surmised to be completely out of form, and out of “what is expected”, and out of “what is desired” – as a pop musician. The word “norm” seems to be of great importance to most people – something I totally disagree with. The thing that captivates us about a true artiste, I feel, should surely be the fact that he is different and unique, which D is. The fact that mamas like me are so defensive and protective of him, may have also contributed to the masses thinking that we are a weird lot, thus all these questions thrown at us. I’ve been asked at least twice, whether the reason I like D is that I have no sons of my own. I was flabbergasted. But even more flabbergasted about how the minds of people work. I am dissatisfied with the way my thoughts are formulating at the moment because I find myself not being able to express them properly and coherently. I am spending much more time writing this response to you, than I’ve ever before in my comments. Must I then come to the conclusion that the quality of D is inexplicable? Is it time for D’s music to take on a more edgy quality, just to attract more audience? Was it a good idea then, that D went on a 2-year mission, so that he can “grow up” and join the rest of the singers to become “more acceptable” to the world? Dang! I was halfway through my comment then the computer restarted. Why la?! Anyways, I’m not sure you get my point entirely auntie Trace. I think people are justified in questioning why we love D. I think that they should in fact. I have on some occasions asked myself why I’m a fan of his. The reason being is not that he doesn’t conform to the pop singer norm, it’s that he does. Because he’s young, people expect him to sing cheesy pop songs with light or ambiguous subject matter, which he does. With the exception of maybe his covers which are technically not his songs per se so they don’t really count. Let’s face it, Crush was a kinda corny song. If you were to go to a music suggesting site such as musicmap.com and typed D’s name, the suggested artists are usually those Disney channel starlets, high school musical sort. The success that I wish for him is not the mainstream success of those singers on the radio but to gain more respect for his music amongst fellow musicians and lovers of music. Permit me to use Cook as an example, seeing as they sorta started of the same way. If asked, most people would say Cook is the better musician even though D is the one who’s enjoyed more commercial success and is seemingly more popular, on the whole. Cook’s music is more raw, he’s more willing than D to put a part of himself in his music. (Listen to Permanent.) Music is after all an extension of yourself, a way to communicate your story. Look at TOSOD, don’t tell me D’s personality is That shallow?? D can honestly do better than he has done. He hasn’t focussed on music as much as he should. There’s more to music than just performing, there is the artistry behind each piece. A musicians job includes creating new music. There’s a whole world of different sounds and music to draw inspiration from and thus far he hasn’t been very creative. Every one of his albums has been a rushed job. Good albums take time to make, sometimes years. I blame the fact that he’s to distracted by lesser things such as catering to his fans. I’d really like to make him understand that he doesn’t owe us anything. It’s not because of us that he has a career, it’s because of his love of music. It’s to music that his debt is owed. So as fans I think we should stop encouraging him to do unecessary things like corny soaps, awkward mvs, dougie etc. anything that detracts from him making good music. Even going on tour, which I don’t think he should do immediately when he gets back. Straighten out his career first. I was kind of annoyed with Kari when she said he was almost certainly going on tour after the mission. About getting D to play Marius, can I do the nudging of his six-pack ? 🙂 lol sorry. I mean singing on Broadway’s not really detracting from his music right? I think it might be more worthwhile than what he’s done so far. We might even get a song about it? I’m not a Jonas fan but I know Nick Jonas did play Marius for a bit. I used to think he was cute when I was 15, before David. hehe But I’ve never actually heard him sing. Sigh, both of you are right! I too hate it that others think we like David because he’s cute and there are others who definitely doesnt care two hoots about his voice but WHATEVER! You’re absolutely right when you mentioned that other artistes command more respect than David. He needs to project the self confidence not only in his performance which we know he has it in spades but to come across as someone who is extremely comfortable being himself. I am only hoping that he gets top management when he’s back because that will make all the difference. There are loads of cheesy pop songs out there but must David be judged otherwise if he sings them? Oh well, such is the ruthless nature of how some opinions can be. Guy Sebastion is the 1st Australia Idol. He won the title in 2003. He has been making music since then till now. This is his latest from his recently released album. Does anyone know he was born in Klang? On the one hand, his generosity of character wanted him to sing directly to the people almost as a missionary, and to please them any way he can; on the other, the wish to do what he really wants to do deep inside. I don’t know how much you believe in horoscopic character traits (I am a strong believer), but the account I gave a couple of threads ago, mentioned that he should avoid his tendency to “scatter” to accomplish what he wants. And part of this “scattering” had led him to doing things like what you said…soap operas etc. Doing all these “sidelines” is also due to his generosity of spirit to want to please his fans – fans who have been so supportive of him. I don’t think he gave much thought to his long-term career – which really should be his music – music that would propel to him to bigger success in the long run – music that would gain him more respect as a good musician. Like what I’ve always said, He Needs A Manager!! Tosod (despite my profession of liking it for reasons of loyalty and faithfulness) is more like an instructional manual for young people. It is STR that, I think, that reveals more of the inner him, but which he thinks does not contribute to his being a good role model for young people…you know, like anger..complaints..that sort of thing. D wants to come across as a moral person and has a strong desire to “change the world”, he has done what he has done to gather people together to give them “a dose of goodness”. But what the music world wants is NOT that. The religious teachings of the world will take care of that – what the listeners want is great music from him. Nice inspirational vid and song! I like! Malaysia Boleh!! 😀 Good choice Shirley! It reminds me D’s Everybody Hurts. Sometimes I feel like throttling D for not realising the importance of getting a manager – like he thinks he can do every single thing himself! Hhmmph! The music world is so competitive, that strategies, image impacting etc need to be planned out properly. He should just concentrate in writing songs and thinking about how to sing them best. The manager should also guide his path towards the stars – not just to play little games to please fans. Am I too harsh? I just want desperately (yes, that’s the word…I love him that much) for D to become a much bigger success as he deserves to be. Back to D’s music. I feel that message songs are a bit pointless and frankly a bit lazy. There I said it. I don’t see D as a role model for myself, I don’t share some of his beliefs and ideals. Sometimes religion tends to segregate rather than bring people together, I don’t think it should take precedence in his music. Religion deals with higher matters, of righteousness and moral concience, whereas music is itself more worldly. Some people feel this disconnect towards religious music, as if it’s not addressing themselves and their individual issues but rather the issues of society as a whole. Music is for people to feel better not to humble them. It’s not that D must cater to what the world wants, I feel that he needs to contribute to music itself. We have supported him all this while but he shouldn’t feel as if he owes us anything. As I said before, he has to repay his debt to music itself. This isn’t about popularity or success. Respect will come when it is due when he learns to respect himself and his own abililty to create. When it comes to D – perhaps in other matters too – you are a wise old lady. I take my hat off to you for having so many solid opinions..
I’m glad we share the same opinion that D should just focus on his musical creativity. Making many individuals feel good and “curing” them of whatever emotional ailments – of which there are many – is admirable, but his main commitment should be directed towards himself and his music, and not his fans. Many people are put off by the fact that D sings too many “message” songs. Perhaps that’s the commitment he has made to himself? Perhaps that’s the way he wants to contribute to music? What do you think? As a matter of interest, will you still support him if he delves further into religious message songs when he comes back? I’m asking this because you mentioned that religion is about higher matters, and music is more wordly. As for me personally, it is D’s voice. I would go through any debate, dumb or otherwise, in defence of that. And I would support him whatever music he comes out with. Ive finally watched Les Mis just now with my daughter, Genie. What an epic movie! What an amazing star studded cast! Even Genie said it was such a good move to my utter surprise as I thought she went along merely to accompany me. Yes, I would love for David to play the role of Marius. Maybe in twenty years down the road he’ll play Jean Valjean, wont that be great? I absolutely love Anne Hathaway especially during the I Dreamed A Dream part. Brilliant, beautiful and heartbreaking singing. Such raw emotions displayed so well and of cos that reduced me to tears. Haha if David played Marius, we’d all get DVDs and watch over and over again. I’m sure some people would fly to New York just to watch. 🙂 Lol auntie Shirley, did you tell your daughter you think David would make a more dashing Marius than Nick? You know, even if David were Marius, I still think I’d prefer to play Eponine instead of Cosette. If I were in the musical, hehe. I’d get more stage time and I’d get to sing a solo. On my owwwnn…pretending he’s beside meee… haha pretty much how I feel about D most of the time. If Tracy’s interested then she can be Cosette. lol what imagination I have. I agree we shouldn’t delve too deep into religion here. Have you read Midnight’s Children? By Salman Rushdie. I’m reading it at the moment. In contrast to maybe Life of Pi which wants to make you believe in God this one sorta questions your belief. I heard there’s a movie coming out too, wonder how they’re gonna pull that off. I don’t think message songs are David’s commitment to music. David was mass-producing music really and message songs take the least time to produce. Hardly any thought is needed because you’re reiterating what people already know. I’m not sure if I’d continue to support David if he goes into religious message songs. I mean I’d imagine I’d still love him but I wouldn’t be able to agree with that. I don’t mind him singing religious songs at Christmas but that should be it. I know David is one of those religiously tolerant Americans and he’s not fanatical about his religion either so I don’t believe I have to worry about that. I now have new respect for Anne Hathaway. I’ve only seen her in light comedies like The Devil Wears Prada…where I thought she was over-shadowed by Emily Blunt who was really super in that film. I too thought Anne Hathaway was really brilliant in that I Dreamed A Dream sequence and she drove me to huge tears. I hear that she is nominated for Best Supporting Actress in the Oscars, which she most definitely deserves. Singing Live in a drama is something new and Tom Hooper was actually taking a great risk but the cast did so wonderfully well. Did you guys see The King’s Speech also directed by TH? Great film. Yes I have read Salmon Rushdie. His kind of stories will be difficult to make into films. To make a film that is “pro-God” (can’t think of a better word) is not difficult – I have masses of dvd’s that talk about Jesus and his life and enjoy watching them. But a film that raises questions on the subject – especially SR-style – will make him into a controversial figure again and perhaps start some unwanted uprising once more, which I think is something we don’t want especially at this point of time. Me too, now that you have mentioned it, I wonder how they are going to pull off a film like that. I personally like to ask questions about beliefs that have already been established. Not out of disrespect but out of curiosity and a desire to intellectualise. But I do that only within intimate quarters. I am rather sad that the minds of most people in the world are too closed-in and acute sensitivities are too rampant. What a shame. One should be able to discuss things without having to get into fights and huge conflicts. I agree totally that tolerance is THE most important aspect in life. David never did talk about his religion before to the fans and was always respectful about the differences between peoples. That’s why I wonder and worry how his “conversion” of people in Chile. – Whether that habit will change him by 2014 – and whether he is comfortable doing what he is doing at the moment. I think there may be something wrong with me. When the lights came on my mum had red puffy eyes and was sniffling but I didn’t feel moved to tears at any time during the show. I mean, watching it just makes me feel like singing. She said it’s more emotional than the stage play because you can’t see the singers’ faces in that one. Thanks for the vid auntie Trace. Why can’t I sing like Nick Pitera, then I can sing the whole musical by myself. When I said I wondered how they’d pull off a Midnight’s Children movie, I was referring to the long-winded, non-chronological way in which Saleem tells his story. If I were Mr Rushdie, I’d want the movie to court controversy like the book did. That means I would have achieved my objective as the writer, to get people thinking and make some people angry. If there isn’t some form of outrage then the book/movie wouldn’t have made much of an impact. It’s not really aggravating the situation much, considering, uprisings occur for useless reasons most of the time. I’m kind of worried about David actually. I heard from some archies, that Elder Archuleta has apparently set a record number of baptisms in his area. This was from the Racangua mission site. Of course they urged other missionaries to follow his example. I’m not sure I agree with tabulating the number of baptisms. I thought most of them would treat this more like a peace corp sort of thing. If they counted like the number of houses built for the poor or increase in literacy rate I think it might sound better. I’m not trying to be critical of the religion or anything. David’s obviously comfortable with what he’s doing. Russell Crowe definitely can’t sing. I don’t know why he was in the film – even his acting was below par – he took the intensity of all the emotions away from it. For example, that scene when Javert plunged into the river (btw that plunging scene done onstage was most remarkable – watch it when you are in London), the actor who played Javert worked the audience’s emotions to such a pitch, then jumped, and we were left completely numb. But RC’s ineffective singing and acting just made that plunge emotionally ineffective. Literature that courts controversy is good because it makes the readers think. But certain people (not mentioning who they are) will want to “come up in arms” – physically. Like using the word “KILL”. Whereas if most people can deal with the controversy intellectually, by just debates and such, then I’m all for it. Off topic, have you seen Dead Poets Society? That’s another movie that made me cry, and I’ve seen it more than 20 times on my dvd. It’s a pretty old film, when Ethan Hawke was still very young. He is way ahead of your generation. It’s about “sucking the marrow of life” – very touching. It would be most suitable for your age group especially to watch it. Trace, I thought Ethan Hawke was rather nice looking back then. Too bad I didn’t get to watch Dead Poets Society. Next time we meet, you must tell me how onstage Les Mis was like ok? I have heard of the Dead Poets Society. One of my mum’s favourite shows. But I haven’t sat through the whole thing. They show it occassionally on astro so I have seen bits here and there. Of course la I’d prefer to marry David and have Eddie sing at the wedding. I don’t go onto a Eddie Redmayne fansite everyday lol. I love Eddie’s voice but David’s was my first love. And anyway you can’t really empirically compare their voices unless we fixed some variables and both of them played Marius. Anyways I still prefer David’s voice and also he’s cuter than Eddie. David’s OS is always so slow in posting D-stuff ya? If you remember, we did post the vid of the Rainbow Remix almost immediately after it appeared, but then, some people thought we were being “pirate -y” so we decided to remove it. But we did have a couple of days of watching David do his “awkward” dancing (how liying put it)! Lol! And of cos you were flappin’ your arms with excitement hehehe…! This is specially for liying, if she really has not watched it. Ethan Hawke was definitely good-looking and he was really cute in Dead Poets Society. After you’ve seen the fil, both you and liying would love him!! He is looking really gaunt nowadays though. Tell us what you think of his moves this time. Improved? Still lovable riiight? Salsa moves with a “saucy” flavour…together with D’s Latino good looks would be …..sigh..lagi mati…..